As the introduction to this fact-filled little book says ‘At the end of the 19th century Kinlochleven did not exist‘. 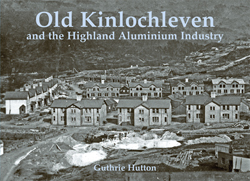 It was a combination of scientific endeavour and natural resources that turned this quiet corner of Argyll into a bustling hive of industry as the British Aluminium Company expanded and thrived. Building the huge Blackwater dam generated a need for housing and a community sprang up around the work. The photographs of the early town and the phenomenal structures under construction there are truly amazing and Guthrie's detailed text draws us in to the story of the building of a community which though changed, still thrives today.